To see the best daily acrobatics show in Beijing, go to Chaoyang Theater (朝阳剧场; Cháoyáng Jùchang) in Chaoyang District near the center of the city. Though it is a small theater, it has become one of Beijing&apos;s tourist highlights. There are two shows daily in the evenings, and the quality of the performance is very high. Chaoyang Acrobatics Theater has been putting on traditional acrobatics shows for nearly 30 years. The theater, which is a cultural center, prides itself on having performed for more than 3 million foreign guests, including foreign leaders and dignitaries. Built in 1984, the Chaoyang Theater is 3000 square meters and can seat up to 1400 people both upstairs and downstairs. An acrobatics show is performed twice a day at Chaoyang Acrobatics Theater. The show includes everything from bicycling and fire stunts to contortion and lion dancing, making it the most popular acrobatics show in Beijing. The show also combines traditional acrobatics with the more modern allowing it to bridge the gap between ancient Chinese culture and the modern, globalized world. Its transcendent nature and talented cast makes the show a perfect tourist stop for people of all ages and cultures. You&apos;ll be entertained by a variety of stunts, dancing, and loud Chinese music. The show includes tumblers, gymnasts, and contortionists. They perform in rapid succession to keep the audience on their toes without a break in the suspense. They spin big spindles on ropes and spin plates. There are giant wheels, and you might see a blindfolded acrobat juggling and skipping rope on top as the wheels spin. There are also martial arts choreographers, acrobatic stunts, and female dancers in exotic costumes. Motorbike globe: The most dangerous stunt involves motorcyclists cycling around inside a transparent globe that looks to be about 18 meters high. More and more riders enter and cycle around in fast circles. They mostly cycle horizontally parallel to the stage, but sometimes they go vertical perpendicular to the stage and make intricate interweaving patterns in fast frequency. At the climax six cyclists circulate together inside the sphere. Human pyramid on a bicycle: A group of women cycle in circles. More and more women climb on the bicycles and sit on their shoulders or bikes, until there are eleven women riding on one bike in a human pyramid. 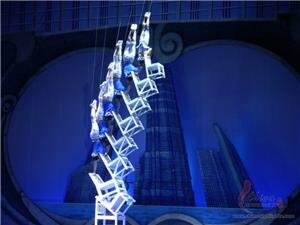 Chair tower: A solo acrobat constructs a higher and higher tower with chairs while balancing on the top of them. 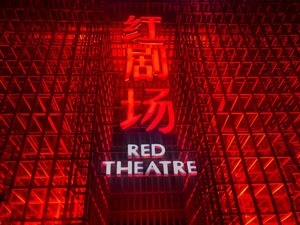 The theater is in a prominent location in Beijing&apos;s Chaoyang District next to a subway station and south of the Olympic area. The theater was built in 1984, so the facility isn&apos;t modern. But the acts makes it one of Beijing&apos;s best cultural centers. It was designated as such in 2001. The building has two stories and can seat about 1,400 spectators (first floor 800, second floor 600). There are 22 rows of seats on the first floor. The lower floor tickets are priced higher, but the view from the first rows on the top floor are just as good or better (see prices below). A small auxiliary theater hosts Peking Opera performances. But tourists generally consider their performances to be second-rate compared to more famous Beijing Opera theaters. Times: Two shows daily at 5:15 pm and 7:15 pm. Cameras are allowed. You can capture some awesome videos as mementos of your trip. The window ticket prices depend on the row and floor. Our agents can probably help get them cheaper. Contact us for assistance. Ticket reservations are necessary to ensure getting a seat on crowded days. There are no restrictions on cameras so feel free to take some memorable pictures or alternatively, you can get a DVD of the show to take home with you. There are refreshments available but you may also bring your own to enjoy during the show. 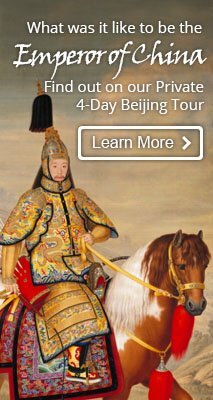 Book a Beijing tour including the show with China Highlights. Chaoyang Acrobatics Theatre is in a central area of Beijing, making it convenient for tourists and visitors to enjoy other food and attractions before and after an acrobatics show. 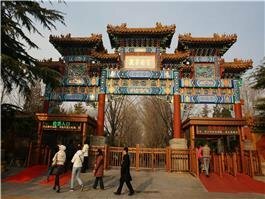 Chaoyang Park, Beijing’s biggest park, is 1 kilometer northeast of the theater and as the largest park in Beijing, it is a peaceful place to take in the sights and sounds of the city before you attend a show. At the park, you can get a bite to eat at Annie&apos;s Italian Experience or just sit by the peaceful Nanhu Lake. Take Line 10 from Hujialou Station north one station to Tuanjiehu, walk east 1 kilometer down Nongzhanguan South Road, and then take Chaoyang Park Road to the entrance of the park (about 500 meters). 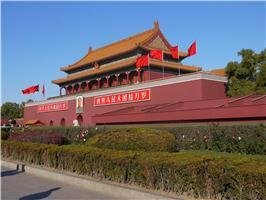 If you would like to eat closer to the theater, you can try Madam Zhu&apos;s Kitchen, Dongshengge Dumpling Restaurant or the very popular Beijing Dadong Roast Duck Restaurant. After the show, you can take the metro one stop further south and take in the radically unique architecture of the CCTV Headquarters, the state run broadcasting company.